Finland is equally known for its unspoiled nature and modern high-tech society. 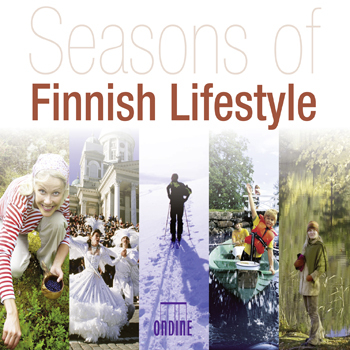 A unique combination of tradition and innovation defines the Finnish lifestyle throughout the year, as you will find explained in the booklet notes. Examples of typically Finnish activities during the seasons (such as May Day and midsummer celebration, wife-carrying competitions, sauna and ice-swimming, to name but a few) are illustrated through numerous photos from the Finnish Tourist Board imagebank. The enclosed musical CD invites you to listen to short classical pieces by Finnish composers such as Jean Sibelius, Einojuhani Rautavaara, Oskar Merikanto and Lasse Mårtenson, including popular Finnish songs featuring such greats as Karita Mattila, Soile Isokoski and Jorma Hynninen.